I still had my Mixed Media supplies from this card, among other things out of my desk, if you can imagine that! I'm managed to work myself into such a small work space, that it really looks like a bomb went off in there! 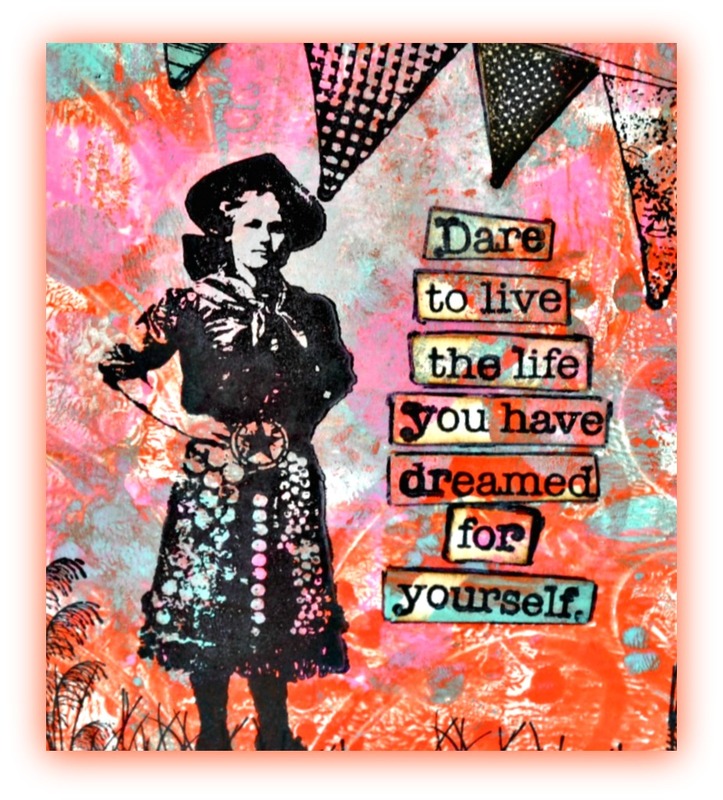 I love the Artistic Outpost Vintage Art Stamps, and used stamps from the Cowgirl Strength, Kudzu Kafe and Keeper plates to create my card. 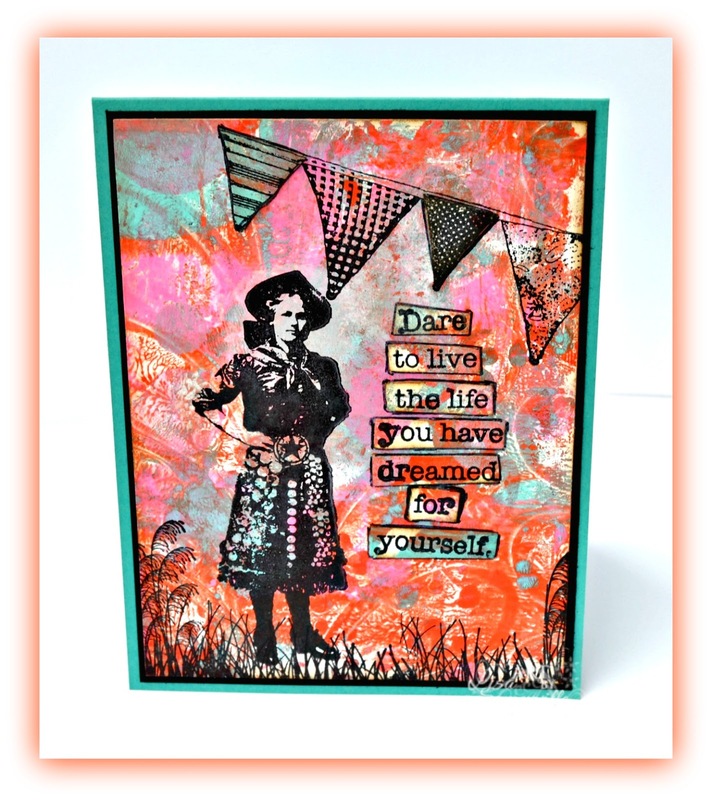 To create the background panel, I applied DecoArt American Multi-Surface Satin Acrylic Paint in Poppy, Coastal Waters and Flamingo to my Gelli Arts Plate, then added the Camille, Dottie and Jacks Stencils from Just a Trace to the Gelli Plate, and made a print onto Mixed Media Paper. Once the print was dry, I stamped the cowgirl and pennant bunting from Cowgirl Strength in Ranger Black Archival. I stamped the pennant bunting a second time on scraps and layered a few pieces over the stamped image. The grass is from the Keeper plate, stamped in Black Archival using a SAMJ. The sentiment is from the Kudzu Kafe plate, stamped on scraps of the monoprinted background, sponged with Ranger Gathered Twigs Distress Ink and adhered to the background panel using DecoArt Decou-Page. To make the sentiment and pennant bunting pop, I outlined them using a STAEDTLER Triplus Black Fineliner. Other - DecoArt American Multi-Surface Satin Acrylic Paint (Poppy, Coast Waters, Flamingo), Just a Trace Stencils (Dottie, Camille, Jacks), Ink Blending Tool, Brayer, Gelli Arts Plate, DecoArt Decou-Page. I love the stamps...so sad they are sold out!